Welcome to the lighting package page. This page allows you to view the lighting effects before you make your decision to upgrade. 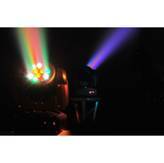 DJ Felix Entertainment offers the highest quality in today's lighting effects. 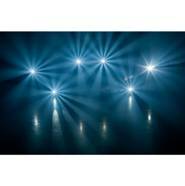 We use the latest in fully automated highly intelligent lighting for our shows. Don't forget that the fog comes with the lighting package. When you add these lights to your event along with the music your dance floor will never be empty. These are the latest and greatest in the lighting technology today. The American DJ Ricochet. The internal mirrors move so fast they create a Laser like effect! There is an amazingly bright 20 watt LED and it covers the largest of rooms with ease. Great with high intensity music and a little fog this light is sure to create a large scale impact. 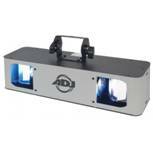 The ADJ DOUBLE PHASE LED is a cool light of it’s own. With may possibilities including just setting it on the floor and letting it go to town is just cool enough. The beams of light flying through the air in just a mist of fog is way beyond cool. 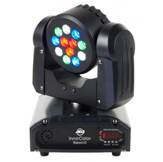 The AJD INNO COLOR BEAM 12 is a extremely bright moving head lighting fixture. This lighting fixture has an amazing total of 12 3-watt CREE LED’s. We have the opportunity to be on one side of the room and throw light all the way across the venue with ease. This is a great high intensity light with fast high beat songs. 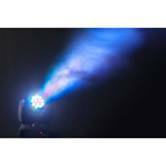 The American DJ Inno Pocket Spot is a great mini high energy moving head lighting fixture that creates both excitement but also a high output of light in the brightest of rooms. This light is so great, we use it at every event we do! room! Great for all events and even slow songs when used right! 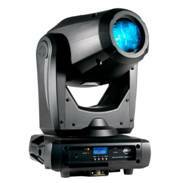 Here is the American DJ VISI Spot LED Pro. It has an amazing 50watt LED source that is sure to blow the top off of any roof. With the vibrant and bright colors, this will surly fill the sky. CHECK this out! Our latest and greatest. NEW UV LED BLACK LIGHT! American DJ Has out done themselves with the innovation of LED black lights. 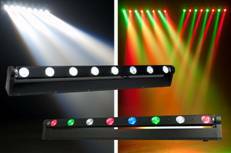 This extremely powerful yet lightweight compact LED fixture packs an extremely big punch. 1 light alone will fill a LARGE room making everything glow. This is the AMERICAN DJ MEGA PIXEL LED. This LED unit has a whopping 128 BLUE, 128 RED and 128 GREEN LED’s that will set the mood for any type of event no matter what. The fixture will fade form one color to another smoothly and slowly to fill any room with a very calm and warn feeling. Here we have the American DJ Profile Panel RGB. This great color changing light is sure to CHANGE the mood on the dance floor! No real effect other than just changing color. Great floor filler. This is the AMERICAN DJ FREQ-5 strobe light. With LED’s we all know that this is a very bright strobe light. They fill the largest of dance floors with ease projecting its Hi-impact light straight into the crowd. (Weddings) When the hall lights are turned down, we set the light to stay on (without flashing) to light the dance floor for special events throughout the reception. This is the American DJ FREQ MATRIX. 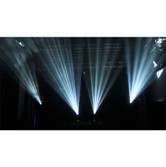 We use massive strobe light for extremely large venues & with a large number of guests. Able to fill the largest room with ease. When we need a wash lighting effect, they simply just get turned to the ON STEADY position to light up our dance floor without having to turn on the venue lighting. Here we are with one of the most advanced LED moon flower lighting effect of its time. The AMERICAN DJ REVO 4 is a full blown LED effect with no moving parts to fail! It’s incredibly bright LED’s are second to none. Whether it’s aimed at the ceiling or the floor the effects are beautiful, amazing & eye catching. The American DJ Starball LED is a Miniature simulated mirror ball effect. With the 3 watt LED being able to turn on & off faster than a traditional bulb, it allows it to not only strobe but project beams of light across the entire room! During slow songs we slow it down and stop the strobe effect to add that extra touch for setting the mood. The American DJ Aristream WiFi pack allows us to run out lighting system wirelessly! Less wires and less mess! This is the ELATION DMX OPERATOR 192. It allows me to have total control over most of the lighting effects. This also includes SPOTLIGHT ENTRANCES AND FIRST DANCES ALONG WITH THE SPECIAL SPEECHES!!!! We are the only local leading DJ Company that offers this feature. Need lighting in a specific area? Yeah I can do that too. (While keeping the party going all night long.) Best of all, it can be in almost any color too. This is the AMERICAN DJ fog fury 3000. This fog machine puts out 21,000 CUBIC FEET of fog per minute. The FOG fury will fill the largest of rooms with ease. However when it comes to your event we may only need a little just to add effect to the lighting. This beast of a machine is a must when it comes to school dances. Here is the American DJ BUBBLE BLAST! Creating hundreds of bubbles for whatever effect we need to help make a non forgettable night. Great for graduation parties, birthday parties and school dances! What a GREAT effect when walking down the aisle when your getting married!!! The WOW effect! This is the American DJ IKON Projector LED. Imagine walking into your Hall/Venue and having your wedding name projected at the entrance doors! This is a GREAT personalized touch for any event. This unit has a 60W LED for that awesome Crisp color. (Extra fees apply for personalized Gobos. 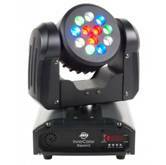 Our new AMERICAN DJ 5PHEX up-lighting is superior to all other up-lighting on the market today! We are so proud to offer this new product to our Brides & Grooms. We carry 30 of these wonderful BRIGHT 10 WATT LED’s. Imagine walking into your wedding reception with the exact color of your wedding. We can do up 65 preprogrammed colors. Then when you allow room for color mixing one the fly your colors have just become unlimited including BLACK & WHITE! As you can see this is a 6 color led allowing us to start with a BASIC RED, BLUE, GREEN, WHITE, AMBER & ULTRAVILOT (BLACK) and then allowing us to color mix from there.